Hampton Inn has an indoor swimming pool and air-conditioned rooms with a flat-screen TV and free Wi-Fi. Located in Orange Prairie, it is 2 miles from WeaverRidge Golf Club. Each room at Hampton Inn is fitted with deluxe bedding and feature a plush armchair and ottoman in the living area. Each one has a coffee maker and well-lit work desk with a comfortable side chair. At Hampton Inn, Guests can enjoy hot and cold items for breakfast including waffles, bagels and fresh juices. Cold beverages and packaged snacks are available 24-hours a day from the vending machines. 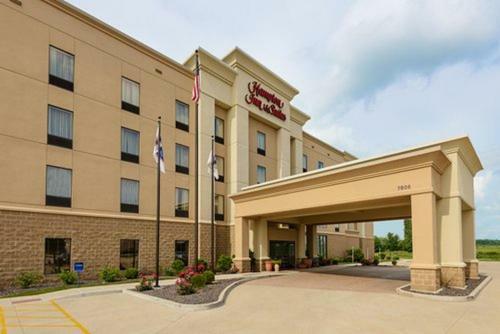 Hampton Inn and Suites Peoria is less than one mile from The Shoppes at Grand Prairie. RAVE Motion Pictures Theater is half a mile away. the hotel Hampton Inn and Suites Peoria at Grand Prairie so we can give you detailed rates for the rooms in the desired period.